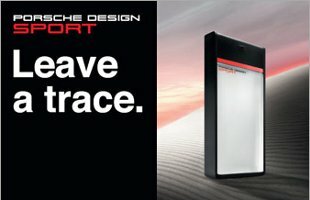 Porsche Design Group has launched Porsche Design Sport, a new fragrance for men "who pursue their goals and meet every challenge". Porsche Design Sport is an aromatic fragrance with citrus, aquatic and woody notes. Update: Porsche Design Sport was developed by perfumer Michel Almairac; notes include grapefruit, bergamot, rosemary, water notes, violet leaves, patchouli, cedar and amber. A wave of cool mint and fresh mandarin splashed with invigorating ginger and masculine musk. I like the bottle for Porsche Design Sport…it’s black and sleek. Whoever did the design for the first Porsche fragrance messed up…they had a weird light blue color…that is not a color I associate with Porsche! I’ve never seen one in person…this one does look cool though. Great Porsche bottle, although I’m always afraid of those tall, thin bottles falling over, particularly if they’re glass (hello, Opium). I always assume that my Lutenses will topple over like a row of dominoes, so I keep them lying down in a drawer (cushioned to avoid breakage and absorb leakage, just in case). That Porsche bottle takes skinny to a whole new extreme. It should come with a stand, like Sculpture by Nikos. That Avon bottle looks to be a low-rent copy of Lauder’s Metropolis, and I’m sure the scent is equally uninteresting, but the model is hello, so they get points for that.